80 meters from the beach calling PIPERI, in the beautiful Naoussa, we created with all our love and hospitality the A' class apartments and studios Katerina. All the studios and apartments have TV, air condition, fridge, kitchen, wonderful view, personal bathroom and daily cleaning. For this friendly environment we created for all our visitors a small paradise of flowers with a variety of colors and species, which helps you to see another part of our island, the colorful and the creative one. 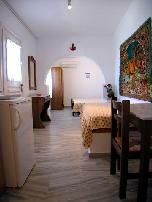 You may visit the apartments and studios with the must beautiful view from the balconies in the Aegean sea! Είστε ιδιοκτήτης ή διευθυντής στο KATERINA APARTMENTS AND STUDIOS; Εγγραφείτε τώρα για δωρεάν εργαλεία, που μπορείτε να χρησιμοποιήσετε για να βελτιώσετε την καταχώρησή σας και να συνδέσετε την ιστοσελίδα σας και το σύστημα κρατήσεών σας.